Last weekend I attended Christ Church of Oakbrook’s 2014 Spa for the Soul women’s retreat at The Abbey Resort in Fontana, Wisconsin. The featured speaker was Oreon Trickey from LaSalle Street Church in Chicago and notes taken throughout the weekend are found below. Blessed is the one whose transgressions are forgiven, whose sins are covered. Blessed is the one whose sin the Lord does not count against them and in whose spirit is no deceit. When I kept silent, my bones wasted away through my groaning all day long. my strength was sapped as in the heat of summer. Then I acknowledged my sin to you and did not cover up my iniquity. in all of it rawness and messiness because that’s when it loses its power. for as long as we need to without allowing it to become our primary identity. you are starting to make your suffering matter. you begin to wish the people who have hurt you well. you own that we are co-creators to situations and the negativity that stems from them. Renewing does not mean going back to the way it was but there is always hope that it can be better. Instead of being defined by what someone has done to you, defy it. Let my story be defined by, not what has been done to me, but by what I have done with it. I believe the Holy Spirit brings people to mind for a reason. Sometimes I take it as a sign that God wants me to pray for them or to reach out and see how they’ve been. Other times, it’s God’s way of telling me that we’re about to cross paths for a very specific reason. Like a few days ago when I thought about a family friend and, before I had a chance to pick up the phone, she called me to say that she was at a convenience store and one of the employees was thinking about coming to Chicago. “Does she know who she wants to see?” I asked. My friend was hoping I would help the employee with transportation once she found a doctor who could see her. Imagine her surprise when I mentioned that I had the number for an amazing colon surgeon programmed into my phone. My daughter Katie was with me a short while later when the colon surgeon’s nurse called me back with instructions to pass along to the person in Nebraska. “After she calls the main number to register, have her call the cancer center to schedule an appointment,” the nurse said. When I got off the phone, Katie mentioned how nice it was that I was helping a person I didn’t know. “Literally,” Katie said with a smile as she reminded me that the name of the person at the cancer center who was waiting for the Nebraska woman to call…was Hope. I recently spoke to a wonderful group of women at at Community Fellowship Church in West Chicago. During my presentation on getting organized, I shared this rhyme to remember: Put every system to the test until the good is better and the better is best. A No Limits Life Coaching Facebook page is my way to improve upon how I share my favorite quotes with others. For years, I have used twitter to accomplish this objective, but there have been times when the sayings that I am most inspired by exceed the 140-character maximum length. Going forward, I will continue to post larger messages to my blog but all tweets will originate here and be passed along to my Twitter profile. If you enjoy the updates, don’t forget to like me on facebook and twitter and invite your friends to do the same. Whoever said that a mother’s job is never done wasn’t kidding: It’s never done. Long after my daughters are tucked into bed, I’m wiping off counters, folding laundry, and making sure that the doors are locked and the lights get turned off. And contrary to what my youngest told a fellow first grader years ago when she had her over for a playdate, I do not sit around and do nothing all day. There are errands to run, calls to make, rooms to pick up, spaces to organize, trips to plan, and countless other projects. Although the amount of work rarely changes, the type of tasks do. 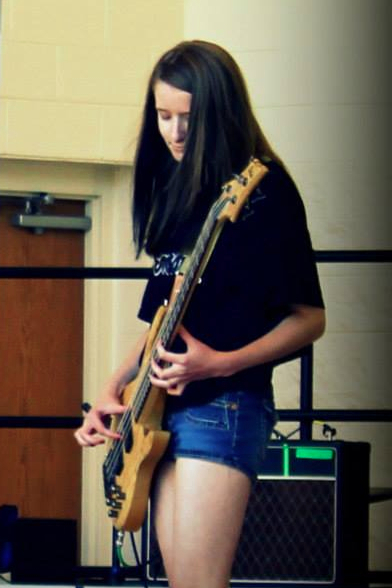 If you had asked me even one month ago, for example, what my focus would be this week, I never would have guessed that it would be shopping to give my eighth grader an edgier look or rearranging her schedule to find time to practice with a professional all-girl rock band. What does the wise counsel of my husband or a Godly friend have to say about what I want to do? Does it go against Scripture? Am I at peace with my decision? Three months ago, I was not at peace with Hollie’s continued requests to dye her hair; but now circumstances have changed and even Bill is encouraging me to schedule the appointment. Hollie has morphed into a disciplined bass guitar player and I have mellowed enough to see that my job as a parent is to support her—even if it means looking for dark-colored clothes that won’t look too “happy” on stage and going to church with a child who is rocking a crazy hairstyle. We can grow with our kids, or apart from them. Achieving the former and avoiding the latter is the difference between following where God is leading and steering children elsewhere. My mother grew up eating Danish crepes. Slathered in butter and sprinkled with sugar, they served as the perfect snack to welcome her and her brothers home after a long day at school. As an adult, she carried on the crepe-making tradition by mixing up a batch every Wednesday night before my brothers and I left for our weekly catechism class. Served with a bowl of scrambled eggs mixed with fried potatoes, it was one of my favorite meals of the week. I had no plans to follow in my grandmother’s and mother’s footsteps until my oldest brother (who is big on tradition) bought me my first cast iron griddle. 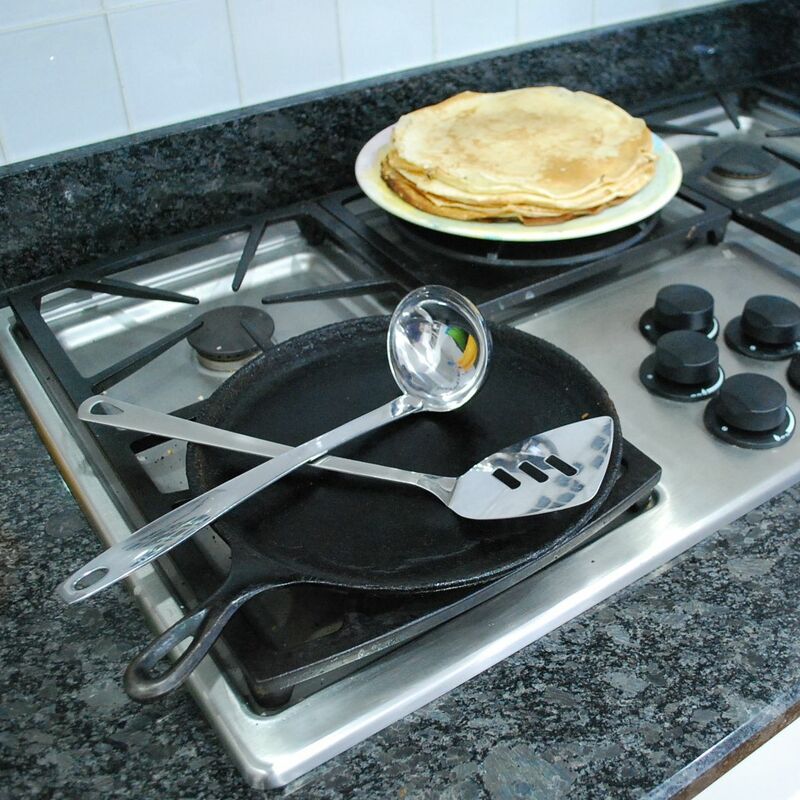 Almost twenty years later, I am still using it to make a weekly batch of pancakes so that my youngest can heat one up every morning before heading off to school. To start your own crepe-making tradition, follow the recipe below. 2. Blend the ingredients, adding more milk as necessary until the crepe mix is easy to pour. 3. Heat a lightly oiled cast iron griddle over medium high heat. Note: To minimize the amount of cooking oil that is needed, I purchased the Misto Gourmet Oil Sprayer (which can be used with any vegetable oil). Another option for spreading a small amount of oil onto a griddle is to use a silicone basting brush that is heat resistant to 500F/260C. 4. Pour a soup ladle of crepe mix onto the center of the skillet and tilt the pan in a circular motion so the batter coats the surface evenly. 5. When the bottom of the crepe is lightly brown, loosen with a metal spatula and flip the crepe over to cook the other side. 6. Remove from heat when the second side is lightly browned. 7. Serve hot and refrigerate leftovers. The beginning of a new year is the perfect time to change up the way you do things, especially when it comes to organizing your digital photos. It’s a time to keep doing what works and ditch what doesn’t. What works for me is organizing pictures by event and adding the year, month and day they were taken to the title of each folder. If I have two events in one day (like a program at school during the day and a birthday party that night), I place them in separate folders and include “01” after the date of the first and “02” after the date of the second activity to make sure that the folders show up in the proper order (see example below). What also works is periodically backing up these folders to DVDs that I give to Bill to take to work. This ensures that, in the event of a fire, our pictures are not lost forever. What hasn’t been working is having to search through every folder at the end of the year to find the pictures that I would like to include in our annual Christmas Card and end of year slideshow. In search of a solution that would make the most of software I already have, I read up on how to use iPhoto Smart Albums and created one called 2013 Best Photos. I then added parameters so the album only contains pictures from 2013 events that I gave a 5-star rating (see article titled How To Create Essential Smart Albums for Your iPhoto Library at www.makeuseof.com). To test my new process, I imported a photo from our camera and gave it a five-star rating. The picture appeared in the new smart album and my photo-taking year is off to a great start, proving that Continuous Process Improvement is not just for companies: It’s for anyone who is up for the challenge of putting every system to the test until the good is better and the better is best!